DOM Knowles’ 94th-minute winner means Harrogate Town will host Brackley in Sunday’s National League North play-off final. The second and third-placed finishers will meet at Wetherby Road after both edged tense semi-finals. 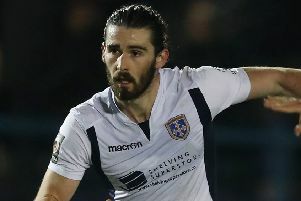 Harrogate eventually prevailed 2-1 against ten-man Chorley and Brackley ended brave Bradford Park Avenue’s promotion bid as Aaron Williams’ 36th goal of the season settled that tie in extra-time – the 110th minute. In front of a 2,307-strong crowd at Harrogate, Knowles clattered an eighth-minute chance against the bar, before Chorley grabbed a 36th-minute lead when Josh O’Keefe netted from close range following Alex Newby’s cross. Senseless play just a minute before half-time then saw Lee Molyneux sent off by referee Rebecca Welch for a chest-high challenge on Ryan Fallowfield. Harrogate were back on terms just past the hour mark when Fallowfield’s cross was handled on the line by O’Keefe, allowing Knowles to drive his penalty down the middle of the goal. The undermanned visitors remained stubborn until the game’s final seconds when Falkingham’s blocked shot fell to Knowles, who kept his cool to beat Matt Urwin. Pickering Town will be playing in the Evo-Stik East next season after securing promotion from the NCE Premier Division on Saturday afternoon. Casey Stewart’s 81st-minute goal sealed a 2-1 victory for Town at Hall Road Rangers0 which meant they pipped long-time leaders AFC Mansfield to the second promotion place. Joe Danby gave Town the lead on 56 minutes only for Dane Mortimer to equalise on 73 minutes before Stewart’s decisive intervention. Elsewhere in the Premier Division, Pontefract Collieries drew 1-1 at Athersley Recreation and Liversedge lost 5-1 to Albion Sports.